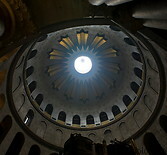 The Church of the Holy Sepulchre, also called the Church of the Resurrection is a Christian church in the old city of Jerusalem. The church was initially built in 325 on the site of an older temple of Aphrodite and was destroyed and rebuilt several times during the centuries. 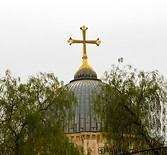 The church is supposedly built on the site of the death and resurrection of Jesus and is an important pilgrimage destination. 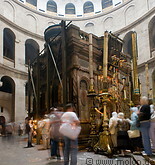 Inside the church visitors can access the site of the tomb of Christ. 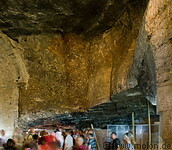 Lower in the church people can walk to the Golgotha rock.